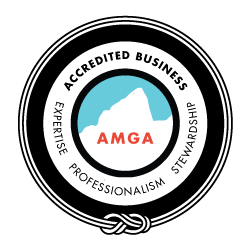 Come and join one of our AMGA trained professional guides for a day of rock climbing. Whether you’re a first-timer, fresh out the climbing gym, or an experienced climber looking to push your limits we can provide a great day of climbing. Smith Rock has climbs for every level of interest. From introductory top-rope climbs rated 5.6 all the way to 8-pitch routes and traditional crack climbs. We guide all of the classic single and multi-pitch routes and we know how to get away from the crowds, find the shady or sunny spots and get more climbing time on the rock than walking and waiting. Our guides will meet you in the morning and get you fitted with any gear that you need to borrow and find out exactly what kind of a climbing day you’re looking for. Then we’ll hit the trail for one of a dozen areas at Smith Rock that have climbs of every style and level of climber. Climb a classic route that you’ve dreamt of, or work on a skill alongside a guide to develop your independence. We look forward to sharing Smith Rock State Park with you and guiding you on some of the best rock climbing in the world. There are no prerequisites for hiring a private guide. We will be happy to customize the day to your interests.